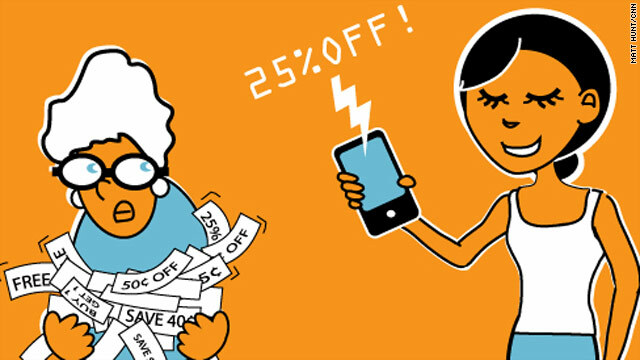 Online sites and apps are growing a nontraditional fan base for coupons -- the young, urban and tech-savvy. (CNN) -- Forget about the little old lady digging through her cluttered purse in the supermarket checkout line. Thanks to smartphones, e-mail and sometimes-scary economic news, denizens of the digital world are now the ones clipping coupons -- even when there's not an actual piece of paper involved. With services such as the iPhone app Scoutmob and e-mail offerings such as Groupon and Living Social Deals, experts say it's now hip to be cheap. "The advent of digital savings tools coupled with a challenging economy has taken couponing mainstream," said Steven Boal, CEO of Coupons.com. "All sorts of people, including what we call the 'sophisticated couponer,' are proudly aboard the couponing bandwagon." A recent survey by Harris Interactive showed that coupon use, particularly online coupon use, has spiked among a nontraditional population -- those who are urban, well-to-do and tech-savvy. In the survey, six out of 10 adults with household incomes over $100,000 said they had used a coupon in the past six months. Four out of 10 of them said they got that coupon online -- a rate nearly twice that of people who made $35,000 or less. Keila Kirkpatrick said she started hearing friends talk about Groupon, a location-based service that deals out a daily bargain in subscribers' hometowns, along with a punchy, fun e-mail description of that deal. "I signed up to see what all the buzz was about, and turned out that they had some really good deals," said Kirkpatrick, 23, who had recently moved to Washington to work for Americorps. Since then, she's used Groupons for a Korean restaurant that she'd never tried and Madam Tussaud's Wax Museum. For the online coupon companies, encouraging that sort of urban exploring is part of the sales pitch. "Our point, simply put, is to help you be a better local," says Scoutmob's website. "The only way to really get to know your city is by getting out, being curious and exploring the scene for all its worth." Scoutmob capitalizes on the rise of mobile social networking apps such as Foursquare and Gowalla, which let people "check in" to locations, alerting their digital friends to their whereabouts. Its original aim was to, in effect, create flash mobs at participating businesses which would offer a coupon for a short time, usually 24 hours. But recently, many have extended their deals, allowing users to better plan social outings based around current offers. The Scoutmob app runs only on the iPhone. The phone's screen, in effect, acts as a user's coupon. Scoutmob co-founder Michael Tavani said the Atlanta-based company has spent almost nothing on marketing, with word of mouth spreading the app's popularity in the 12 U.S. cities where it's available. (Scoutmob's website shows a 13th that will be familiar to fans of "The Simpsons," the fictional Springfield). Between 1,500 and 2,500 people claim a Scoutmob coupon everyday, Tavani said. Then, those "mobsters," in the lingo of the application's regulars, plan "mob hits," visits to a spot by sometimes as many as 25 people at once. Scoutmob doesn't release its total number of subscribers. At Groupon, the growth has been swift and strong, from about 400 subscribers when they started in November 2008 to roughly 5 million in the United States and another 1 million in Europe, according to founder and CEO Andrew Mason. Groupon, which makes its money on revenue-sharing with the businesses it features, is active in 50 cities in the United States and 60 in Europe. "It just resonated well with consumers," Mason said. He points to a recent deal for a boat tour in Chicago, Illinois. Groupon and the tour company expected to sell a few thousand tickets, total. Instead, they sold 20,000 in the first few hours. "If you think about any other advertising medium, it wouldn't have done that for this company," Mason said. "That's the power of the social commerce we've created." He, too, links the success of digital coupons to the emergence of online social-networking -- calling Groupon an extension of the "friending" functionality that sites such as Facebook and Twitter have popularized. "The holy grail is how can we make e-commerce social," Mason said. "Usually, [a coupon] is a pretty solitary, one-to-one experience. But we're helping consumers discover things. "Somebody sees a screaming deal on paintball and, instead of buying one Groupon, they're telling 10, 20, 30 of their friends and sharing it on Twitter and e-mail and Facebook." Heather Sokol does just that, as well as spreading word of coupons she likes on her "frugal blog network," Inexpensively. "When I find a deal worth sharing, I tell Inexpensively readers, friends, family and Twitter or Facebook," said the Indianapolis, Indiana-based blogger. One potential concern, as these coupon applications grow in popularity, is that they could end up being too much of a good thing for some participating businesses. The price cuts offered are sometimes steep, and a small business swarmed with eager subscribers could be trading some significant profit losses in the short term for potential customer gains in the long term. "Our platform is not right for every business, especially smaller businesses that can't handle the traffic," said Scoutmob's Tavani. "[But] businesses that are scaled to serve many customers are ideal customers and loving the new customers we're driving them."